What is your race? Please "X" one or more races to indicate what you consider yourself to be. These are separate questions, because there can be Asian Hispanics, white Hispanics, black Hispanics and so on. The subject of this article is about the black Hispanics as a group. In the socio-economic structure of American society, it is well-known that blacks and Hispanics are disadvantaged minority groups. They earn less money and they have fewer educational opportunities. So our question here is whether the black Hispanics look more like blacks or Hispanics? Are they better or worse off than both? Our reference database is the 2003 Current Population Survey conducted by the U.S. Bureau of the Census. There are 216,424 persons age 15+ included in the survey. Within this survey, 11.8% described themselves as "Black, African American or Nego" and 12.2% described themselves as "Spanish/Hispanic/Latino" and 0.5% answered both and are therefore in the black Hispanic group. Under the assumption of independence between race and ethnicity, the percentage of black Hispanics should be 11.8 x 12.2 / 100% = 1.4%. The 0.5% is lower than that by a significant margin, but these types of data would not provide any explanation. Whether Hispanics choose to identify their race as white, Hispanic or black is not a matter of purely personal preference -- it reflects the social position of group members. This is most evident in the case of the smallest group, black Hispanics, whose individual characterics such as income and unemployment make them in many ways more similar to non-Hispanic blacks than to other Hispanic groups. According to the March 2004 Current Population Survey, the annual household income for the population was US$51,235; US$26,269 for blacks; US$30,187 for Hispanics; and US$25,878 for black Hispanics. So both blacks and Hispanics lag the general (mostly white) population in annual household income, with Hispanics being slightly better off. Black Hispanics are closer to the blacks than to Hispanics in terms of earnings. The detailed household income distributions are shown in the next chart. 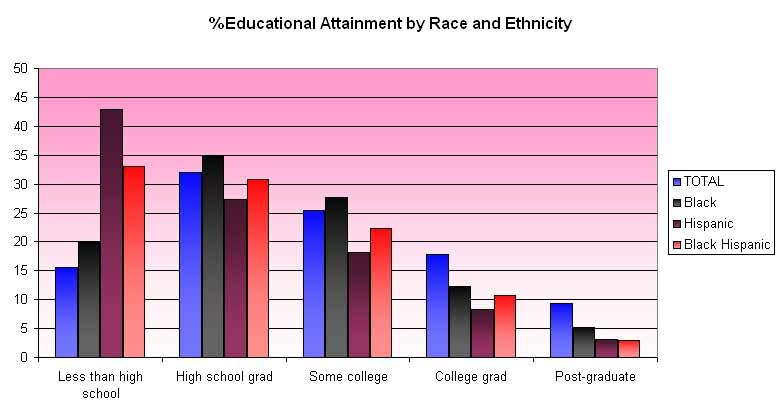 In the next chart below, we show the distribution of educational attainment among persons 25 or older among the total population, blacks, Hispanics and black Hispanics. The average number of years of education is 15.2 years for the total population, 13.8 for blacks, 11.8 for Hispanics and 12.6 for black Hispanics. First of all, both blacks and Hispanics lag the general (mostly white) population. Secondly, the Hispanics are worse off than blacks since there many immigrants who are disadvantaged by not having full command of the English language. Thirdly, the black Hispanics appear to be closer to the more disadvantaged Hispanic than the blacks. We have looked at only two socio-economic varibles here. More generally, we probably cannot say that black Hispanics look more like blacks or Hispanics. After all, their cultural heritage is dualistic in nature by definition.